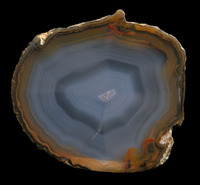 A backlit slice of almost colorless agate, just 3 mm thick, probably from Rio Grande Do Sul, Brazil. 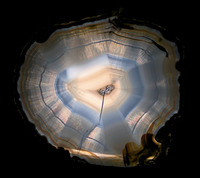 The agate has a faint concentric banding in incident light (see child photo), but when the slice is illuminated with a light source from behind, one can see another pattern superimposed on the banding: fine lines emanate from the rim of the geode to its center. The lines run perpendicular to the wall-lining banding and extend across several bands. When the slice is tilted slowly, one can observe a glimmering movement in the pattern, and there is also a faint play of colors at some places. This line pattern is caused by chalcedony "fibers" that consist of roughly aligned quartz crystallites and that grew from the geode wall towards the center of the geode. Size of the specimen 44 x 40 x 3mm.